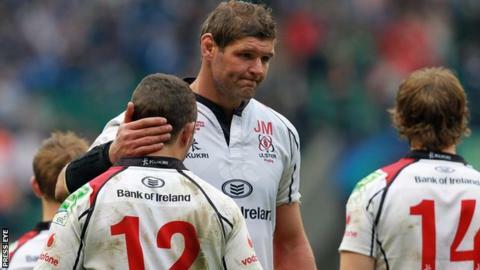 Johann Muller wants to see Ulster end their dismal league record in Wales. The province lost all four league games on Welsh soil last season by a combined total of 48 points. New coach Mark Anscombe takes his team to Swansea on Saturday for an away clash against league champions Ospreys. Muller said: "we lost 10 games in the league last year, which is just a massive amount of games, and we didn't win a game in Wales at all which is something we need to change very soon". Muller took a lot of encouragement from the way Ulster's young players performed in last week's opening league win over Glasgow at Ravenhill. "We were short 10 or 12 regulars, if you can call them that, last week and these young guys put their hands up," said Muller. "We have some senior guys coming back this week and the young guys are so hungry to play again." Stephen Ferris and Andrew Trimble make a timely return to the squad for the first time this season for the difficult trip to the Liberty Stadium. "After losing to Treviso last week, the Ospreys will come out really wanting to prove a point," Muller claimed. "We have been poor in the past in Wales and we need to raise our game. "Welsh rugby is on the up. The national side is doing very well and the Ospreys won the Pro12, so it is a good place to play rugby. "Everything is stacked against us and everything tells you they are massive favourites, but rugby is a funny old game. We are excited to go there."